← 1 Million Thermostats Recalled Due To Fire Risk!! Cinco de Mayo All Weekend! The Mexican Victory over the French at the Battle of Puebla in 1826 is celebrated every year on May 5th! 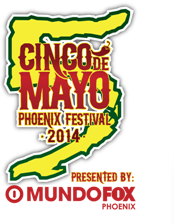 This year Cinco de Mayo is being celebrated all weekend long in Phoenix at the 21st Annual Cinco de Mayo Festival. The festival takes place at 200 E Van Buren, Downtown Phoenix with food, dancing and live music. Music is performed by Grammy Winning Musicians and local legends of Spanish Music. The events start Saturday May 3rd at 2 pm and runs until Midnight. As always, Cinco de Mayo is not reserved for just downtown Phoenix! Many restaurants in Fountain Hills and surrounding areas celebrate Mexican heritage at their establishments. Don’t forget to stop by and enjoy in the festivities! This entry was posted in Area Events, Arts, Culture, Schools & Clubs, Clients, Customers, Friends & Family, Dining, Libations & All Things Foodie and tagged Cinco de Mayo, Cinco de Mayo Festival. Bookmark the permalink.